Tab Allen has been a long-time community member in Elbe and is well known for waving at passing motorists on his bike. “Everybody’s who’s come in our store has always commented about him,” said Mathew Taylor, co-owner of Rainier Mountain Sportz. Allen makes frequent trips from Elbe, Ashford and Mineral, and has even trekked all the way out to Morton. “I know a lot of mountain bikers and I think he puts more miles on his bike than anyone else I know,” Taylor said. Taylor said Allen came into the shop a couple of weeks ago with a broken back brake. After inspecting the bike further, Taylor determined that it was time for time Allen to get a new bike. Allen had made it known that funds for a new bike would be near impossible to come by, as he is unable to work. 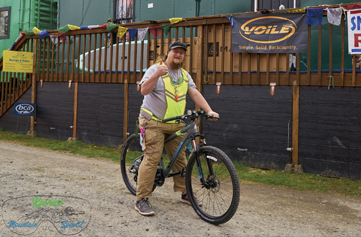 Taylor then decided to set up a GoFundMe account for Allen with the co-owner of Rainier Mountain Sportz, Jaclynn Hawkins. “As he was riding away I could just hear his bike just squeaking with rust,” he said. Taylor posted the GoFundMe link with a photo of Allen on his business's Facebook page and received a large response from the Eatonville, Elbe and Ashford community. Eight people donated to the campaign, raising $220 online. Additional funds were raised at the shop meeting the goal of $520. “You all are so blessed to live in a community such as Eatonville or even Elbe. You guys seem to take care of your own and I’m jealous. Keep doing what you do because it seems to be working.” Julie Parr-Lefor commented on the GoFundMe page. The new bike is a Marin mountain bike, the manufacturer partnered with Rainier Mountain Sportz. It arrived on Monday and was to delivered to Allen the same day.